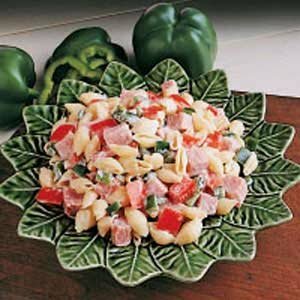 In a large bowl, toss macaroni with ham, green pepper, tomato and onion. In a small bowl, combine Miracle Whip, Parmesan cheese, milk and salt. Pour over pasta mixture and stir to coat. Cover and refrigerate. Sprinkle with additional Parmesan before serving. Makes 4-6 servings.